Once again, this follows the track bed of a disused railway, this time from East Grinstead towards Tunbridge Wells skirting the Ashdown Forest for some 8 miles. 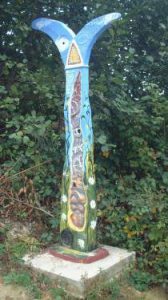 The start can be found at the southern end of the High Street by the roundabout, where the main road goes into the old railway cutting, Beeching Way, now used as an inner bypass. Sustrans have developed this route as part of their Millennium project. Parking is easy in one of two large car parks behind the church. Shortly after going under a brick bridge, Weir Wood reservoir can be seen on the right. The next landmark is the ruins of Brambletye house, which can be seen by climbing the banks to some picnic benches about 1/2 mile further on. You have to cross over a farm road at the old Brambletye Crossing. The track then runs behind some houses to the main road. This must be crossed but since this is the main route to the coast at Eastbourne it is busy and on a bend, however a Pegasus crossing has now been installed which makes crossing here much safer. Go straight over into a farm lane, sign posted Tablehurst farm, go up past the water works and then follow the marked way which is quite narrow behind some buildings on your right. 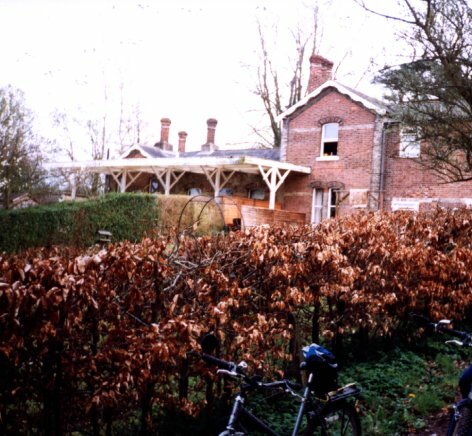 Some of which were part of the Forest Row station. A photo can be found here You soon come out onto the track bed again and cross the river medway. Along the forest way there are a number of Sustrans National Cycle Network (NCN) signs. then out into open country. The route now runs parallel to the River Medway on the left and there are glimpses of Ashdown Forest on your right. Occasionally old railway trackside furniture can be seen. 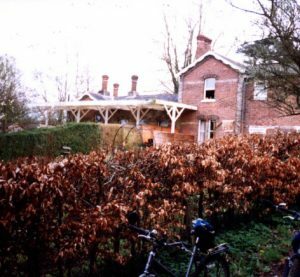 About 3 miles after Forest Row, the railway goes under the B2026 at Hartfield and past a station which has been converted into a private house necessitating a short diversion off the track bed or to see it how it was with the track look here. 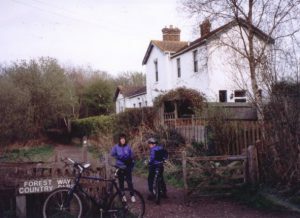 A mile later there is another old crossing and and the old Withyham station. Beware of crossing the road! In a mile, after going under another bridge the B2110 has to be crossed close to where Ham bridge has been dismantled, there is a limited amount of parking in a lay-by here. The track continues along the old trackbed but after a few hundred yards bears away when the old track joins the existing Oxted to Uckfield line. The track bears down to cross the B2188 and then continues parallel to the railway for a while before going under a small tunnel and finishing at the Groombridge – Eridge road by the waterworks Sign at Groombridge.